If you have additional entries to request or improvements to suggest, please leave a comment below and I’ll see what I can do! afferent: Conveying towards a center. agnosia: A loss of ability to recognize objects, persons, sounds, shapes, or smells while the specific sense is not defective nor is there any significant memory loss. Agnosia causes the victims to lose the ability to recognize or comprehend the meaning of objects even with intact senses. allometry: The study of the relationship of body size to shape, anatomy, physiology and finally behaviour. ampsat relay: Satellite amplifier; signal booster and relay. anaerobe: An organism that does not require oxygen. Angstrom: A unit of length equal to 1−10 m (one ten-billionth of a meter) or 0.1 nm, used to express the sizes of atoms, molecules, and microscopic biological structures, the lengths of chemical bonds, the arrangement of atoms in crystals, the wavelengths of electromagnetic radiation, and the dimensions of integrated circuit parts. Arrhenius’ equation: A simple but remarkably accurate formula for the temperature dependence of reaction rates. It can be used to model the temperature variation of diffusion coefficients, population of crystal vacancies, creep rates, and many other thermally-induced processes/reactions. Ascended: People who have chosen to live entirely within virtual reality, their unconscious bodies kept in life-support vats. See Heaven. AU: Astronomical unit; equal to the mean distance between the Earth and the Sun. Big Ben: The nickname given to the superjovian planet located far in the Kuiper Belt which received the signal from Burns-Caulfield. BioMed: Theseus’ biomedical drum. Contains infirmary, bio labs, emergency hibernacula. Dedicated bearings; while normally locked in synchronous rotation with the main drum, can spin to simulate variable gravity to accommodate research or medical needs, up to 8G. blindsight: The ability of people who are cortically blind due to lesions in their striate cortex, also known as primary visual cortex or V1, to respond to visual stimuli that they do not consciously see. brown dwarf: A substellar object too low in mass to sustain hydrogen fusion reactions in its core, unlike main-sequence stars. They occupy the mass range between the heaviest gas giants and the lightest stars, with an upper limit around 75 to 80 Jupiter masses. Burns-Caulfield: A trans-Neptunian object that appeared as an otherwise unremarkable comet with an unstable orbit. Investigated after it received a tight-beam signal, it self-destructed upon the initiation of subsurface radar mapping by the probes. carbon nanotube: Cylindrical carbon molecules; they have unusual properties, which are valuable for nanotechnology, electronics, optics and other fields of materials science and technology. Charybdis: One of the two shuttles carried by Theseus. chromatophores: Pigment-containing and light-reflecting organelles in cells found in amphibians, fish, reptiles, crustaceans, cephalopods, and bacteria. They are largely responsible for generating skin and eye colour in cold-blooded animals. Chromel: An alloy containing of nickel and chromium used for its excellent resistance to high-temperature corrosion and oxidation. ConSensus: The on-board wireless network which all Theseus crew members can access via their artificially augmented senses. Sensory data from other crew members can be accessed in real time. Coriolis (effect): A deflection of moving objects when they are viewed in a rotating reference frame. Cotard’s disease: Also known as Cotard delusion, Cotard’s syndrome, or Walking Corpse Syndrome; a rare mental disorder in which people hold a delusional belief that they are dead, do not exist, are putrefying, or have lost their blood or internal organs. crypsis: The ability of an organism to avoid observation or detection by other organisms. doped ceramic: A dopant, also called a doping agent, is a trace impurity element that is inserted into a substance in very low concentrations in order to alter the electrical properties or the optical properties of the substance. DTI: Diffusion tensor imaging (DTI) is a magnetic resonance imaging technique that enables the measurement of the restricted diffusion of water in tissue in order to produce neural tract images instead of using this data solely for the purpose of assigning contrast or colours to pixels in a cross sectional image. It also provides useful structural information about muscle—including heart muscle—as well as other tissues such as the prostate. ecliptic: The apparent path of the Sun on the celestial sphere; the plane of this path, which is coplanar with both the orbit of the Earth around the Sun and the apparent orbit of the Sun around the Earth. Most of the bodies in the Solar System travel in this path or very close to it, so the ecliptic is used as the reference plane of the Solar System out of convenience. EM (field, waves, particles, etc. ): Electromagnetic. EMP: electromagnetic pulse, a burst of electromagnetic radiation. It may occur in the form of a radiated, electric or magnetic pulse depending on the source, and is generally damaging to electronic equipment. encephalization quotient: A measure of relative brain size defined as the ratio between actual brain mass and predicted brain mass for an animal of a given size, which is hypothesized to be a rough estimate of the intelligence of the animal. EVA: extra-vehicular activity; space walk. Fab: The nanofabrication unit located toward the stern of Theseus, which uses raw material from the telematter mass-reaction reserves to build whatever equipment the mission necessitates. Faraday (effect, cage, bell): An enclosure formed by conducting material or by a mesh of such material. Such an enclosure blocks external static and non-static electric fields. Fibonacci sequence: By definition, the first two numbers in the Fibonacci sequence are 0 and 1, and each subsequent number is the sum of the previous two; they can be used to describe a spiral and are used in computation. They appear in biological settings, such as branching in trees, the arrangement of leaves on a stem, the fruit sprouts of a pineapple, the flowering of artichoke, an uncurling fern, and the arrangement of a pine cone. fibrodysplasia: An extremely rare disease of the connective tissue. A mutation of the body’s repair mechanism causes fibrous tissue (including muscle, tendon, and ligament) to be ossified when damaged. In many cases, injuries can cause joints to become permanently frozen in place. Surgical removal of the extra bone growths has been shown to cause the body to “repair” the affected area with more bone. Fireflies: 65,536 objects of presumably extraterrestrial origin simultaneously hit Earth’s atmosphere on 13/02/2082, 1034:43; the event was dubbed “Firefall.” The objects converged in a precise latitudinal/longitudinal grid; all burned up within 45 – 72 seconds of contact with upper atmosphere. They emitted strong omnidirectional radio signals; the event is believed to have been a planet-wide survey by an extraterrestrial intelligence. Fourier transform: A mathematical transform with many applications in physics and engineering; it can be used to simplify complex functions of time, like sound, wave signals, etc., into a the sum of a (possibly infinite) set of simple oscillating functions (sines and cosines). grunt: A semi-autonomous or remote-controlled drone equipped with weapons and defences. handshaking protocol: In information technology, telecommunications, and related fields, an automated process of negotiation that dynamically sets parameters of a communications channel established between two entities before normal communication over the channel begins. It follows the physical establishment of the channel and precedes normal information transfer. Heaven: (1) An organization that, for a price, provides its residents with complete immersion in virtual reality under their own mental control, by means of neural connections while the residents bodies are kept in life-support vats. (2) The physical facilities of this organization, heavily fortified and secured. HUD: Heads-up display; any transparent display that presents data without requiring users to look away from their usual viewpoints. IAU: The International Astronomical Union. 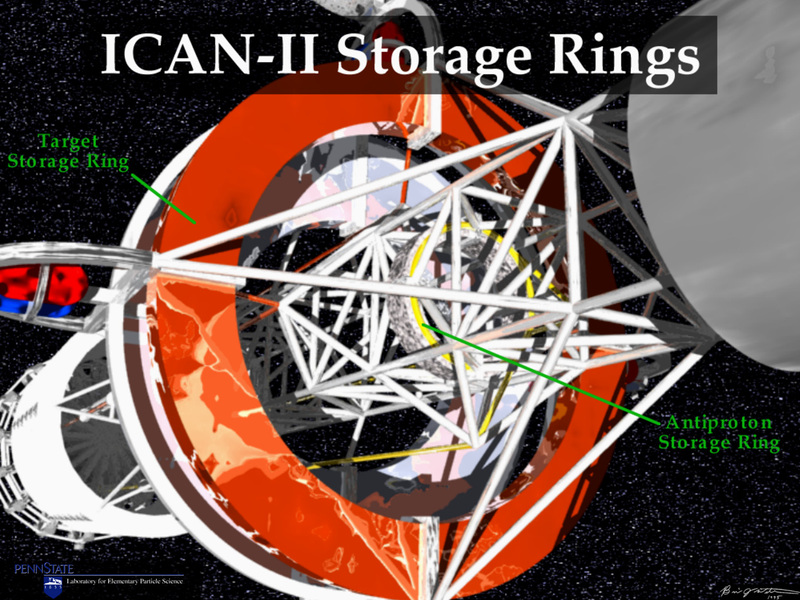 I-CAN: Ion compressed antimatter nuclear drive, which uses fuel pellets ignited to a fusion state by crossed lasers or particle beams. The resultant explosion is partially channelled by a concave magnetic nozzle to provide thrust. Icarus Array: The facility producing the antimatter stream used by Theseus; it uses the Sun itself as its energy source. Kaddish: A hymn of praises to God found in the Jewish prayer service. The central theme of the Kaddish is the magnification and sanctification of God’s name. In the liturgy different versions of the Kaddish are used functionally as separators between sections of the service. The term “Kaddish” is often used to refer specifically to “The Mourner’s Kaddish”, said as part of the mourning rituals. Mourners say Kaddish to show that despite the loss they still praise God. Kapton: A polyimide film developed by DuPont which can remain stable in a wide range of temperatures, from −273 to +400 °C (−459 to 752 °F / 0 to 673 K). Kapton is used in flexible printed circuits (flexible electronics) and thermal micrometeoroid garments, the outside layer of space suits. Kelvin: A unit of measurement for temperature. The Kelvin scale is an absolute, thermodynamic temperature scale using as its null point absolute zero, the temperature at which all thermal motion ceases in the classical description of thermodynamics (−273.15°C or −459.67°F). Klüver constant: One of several geometric patterns which are recurringly observed during hallucinations and altered states of consciousness. Kolmogorov complexity: The Kolmogorov complexity of an object, such as a piece of text, is a measure of the computational resources needed to specify the object. Kuiper Belt: A region of the Solar System beyond the planets, extending from the orbit of Neptune (at 30 AU) to approximately 50 AU from the Sun. It is similar to the asteroid belt, but 20 times as wide and 20 to 200 times as massive. Like the asteroid belt, it consists mainly of small bodies, or remnants from the Solar System’s formation; it contains plutoid bodies (including at least Pluto, Haumea, Makemake and Eris). Lagrange (points): The five locations in an orbital configuration where a small object affected only by gravity can theoretically be part of a constant-shape pattern with two larger objects, such as a satellite with respect to the Earth and Moon. Three (designated L1, L2 and L3) are unstable, and two (designated L4 and L5) are stable and so allow an orbiting object (such as a habitable colony) located there to remain stable without constantly expending fuel to maintain its position relative to the two planets. LOX: Liquid oxygen. Under one atmosphere of pressure, it remains liquid at temperatures below 50.5 K (−368.77 °F, −222.65°C). lumen: The SI-derived unit of luminous flux, a measure of the total “amount” of visible light emitted by a source. MCC: Multiple Core Complex (replaces the obsolete Multiple Personality Disorder, or MPD.) The engineered or enhanced ability to use several personalities in a single individual to process information or accomplish tasks in parallel. MRI: Magnetic resonance imaging. A medical imaging technique used in radiology to visualize internal structures of the body in more detail than is possible with X-rays. Nav-Tac (display): Navigation and tactical. noösphere: The “sphere of human thought”. The word derives from the Greek noüs “mind” and sphaira “sphere”, in lexical analogy to “atmosphere” and “biosphere”. oogenesis: The creation of an ovum (egg cell). Oort cloud: A spherical shell of predominantly icy planetesimals lying roughly 50,000 AU, or nearly a light-year, from the Sun. Long-period comets comets come from the Oort cloud. Parker spiral: As the Sun rotates, its magnetic field twists into a Parker spiral, a form of an Archimedean spiral, as it extends through the solar system. This phenomenon is named after Eugene Parker’s work: he predicted the solar wind and many of its associated phenomena in the 1950s. Phaistos Disk: A disk of fired clay from the Minoan palace of Phaistos on the Greek island of Crete, possibly dating to the middle or late Minoan Bronze Age (2nd millennium BC). It is about 15 cm (5.9 in) in diameter and covered on both sides with a spiral of stamped symbols. Its purpose and meaning, and even its original geographical place of manufacture, remain disputed, making it one of the most famous mysteries of archaeology. plage: A bright region in the chromosphere of the Sun, typically found in regions of the chromosphere near sunspots. polycarbonate: A particular group of thermoplastic polymers that are easily worked, molded, and thermoformed. prionic: Behaving like a prion. an infectious agent composed of protein in a misfolded form, in contrast to all other known infectious agents which must contain nucleic acids (either DNA, RNA, or both). Prions are responsible for the transmissible spongiform encephalopathies in a variety of mammals, including bovine spongiform encephalopathy (“mad cow disease”) in cattle, and Creutzfeldt-Jakob Disease and kuru in humans. Prions, like viruses, are not actually alive, although both can reproduce by hijacking the functions of living cells. qualia: A term used in philosophy to refer to individual instances of subjective, conscious experience. The term derives from a Latin word meaning for “what sort” or “what kind.” Examples of qualia are the pain of a headache, the taste of wine, or the perceived redness of an evening sky. quantical computer: A computation device that makes direct use of quantum-mechanical phenomena, such as superposition and entanglement, to perform operations on data. Quantum computers are different from digital computers based on transistors. Whereas digital computers require data to be encoded into binary digits (bits), quantum computation uses quantum properties to represent data and perform operations on these data. quantum-glial paradox: A theoretical barrier in the search to merge quantum computers with the brain. quantum tunnelling: the quantum mechanical phenomenon where a particle tunnels through a barrier that it classically could not surmount. This plays an essential role in several physical phenomena, such as the nuclear fusion that occurs in main sequence stars like the Sun. It has important applications to modern devices such as the tunnel diode and the scanning tunnelling microscope. ramscoop: Enormous electromagnetic fields (ranging from kilometers to many thousands of kilometers in diameter) used to collect charged particles (ions) from interstellar space and funnel them to the onboard hydrogen-helium fusion reactor, where they are converted to fuel. Rayleigh limit: The angular resolution of an optical system. reducing atmosphere: An atmospheric condition in which oxidation is prevented by absence of oxygen and other oxidising gases or vapours, and which may contain actively reducing gases such as hydrogen, carbon monoxide and gases that would oxidise in the presence of oxygen, such as hydrogen sulphide. Rorschach: The name assumed by the entity which responded when Theseus approached the 30-km-diameter quasi-organic body orbiting Big Ben. By extension, that body itself. Sanduloviciu plasma: Mircea Sanduloviciu and his colleagues at Cuza University in Romania created blobs of gaseous plasma that can grow, replicate and communicate – fulfilling most of the traditional requirements for biological cells. scrambler: Nickname given to an alien life form encountered by the Theseus’ crew. Scylla: One of the two shuttles carried by Theseus. sievert: The International System of Units (SI) derived unit of equivalent radiation dose, effective dose, and committed dose. Singularity: The technological singularity is the theoretical emergence of superintelligence through technological means. Since the capabilities of such intelligence would be difficult for an unaided human mind to comprehend, this emergence is often seen as an occurrence, akin to a singularity, beyond which events cannot be predicted, yet many have made educated guesses about what will follow. sub-q: Subcutaneous, i.e., implanted under the skin. synaptic editing: Alteration of a subject’s responses or reactions to certain stimuli at the cellular level. synchrotron: A particular type of cyclic particle accelerator originating from the cyclotron in which the guiding magnetic field (bending the particles into a closed path) is time-dependent, being synchronized to a particle beam of increasing kinetic energy. synesthete: A person who experiences synesthesia,such as by having a secondary sensation of sound as colour or of colour as sound. synthesist: someone specialized in translating information from one form to another, to allow non-specialists to access information they would not otherwise be able to understand because they lack expertise, vocabulary, background, or context. telematter: line-of-sight antimatter-teleportation drive. See here for an overview of the concept. Tesla: The SI derived unit of magnetic-field strength or magnetic-flux density. Theseus: The ship that is sent to investigate an alien incursion into our solar system. Check out Peter Watts’ own notes on the schematics. TMS: Transcranial magnetic stimulation; a non-invasive method to cause depolarization or hyperpolarization in the neurons of the brain. trans-Neptunian: Beyond the orbit of Neptune. Von Neumann machine: A self-replicating machine; a construct that is capable of autonomously manufacturing a copy of itself using raw materials taken from its environment, thus exhibiting self-replication in a way analogous to that found in nature, as postulated by John von Neumann. 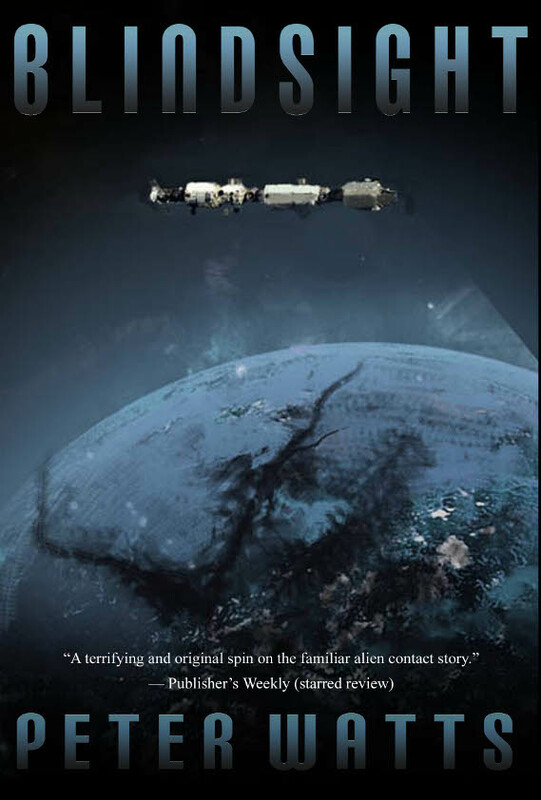 Posted on August 2, 2013 August 1, 2013 by mechanteanemonePosted in books, fictionTagged blindsight, books, fiction, hard SF, peter watts, resources, science, scifi, vampires, writing.